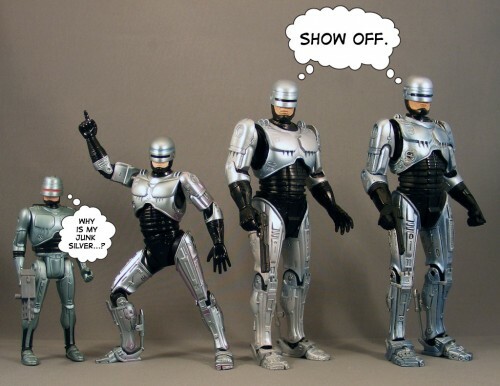 One of the more popular posts in the history of this blog is my comparison of the McFarlane and NECA Robocops. 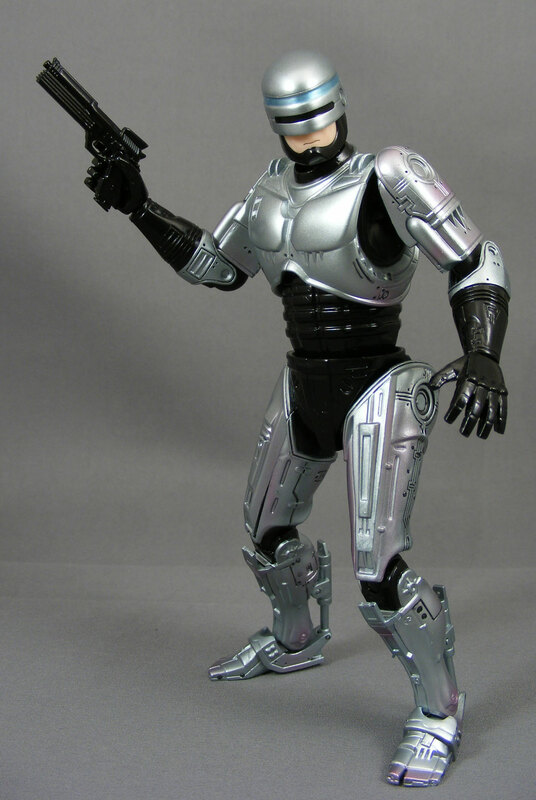 Now that I also own the Figma Robocop, I thought it was time to revisit the topic. If we set aside anything 12″ or larger, there are two significant Robocops missing from this comparison: the Aoshima Robocop and NECA’s spring-out holster Robocop, which seems to be generally considered superior to their first release. Aside from the holster and paint work it’s identical to the first release, so I don’t consider its absence a big problem for what I’ll be looking at today. As for the Aoshima Robocop, well, I just don’t own one so it gets left out. I’ll be honest, I’m really not the best judge of this sort of thing. I know some fans – i.e., most anyone who hangs out here – can nitpick the tiniest differences in sculpt accuracy compared to the source material, i.e., the movie. But unless something’s really glaringly wrong, I tend not to overlook those differences. This is a roundabout way of saying that with the exception of the Kenner figure, they all look pretty good to me. 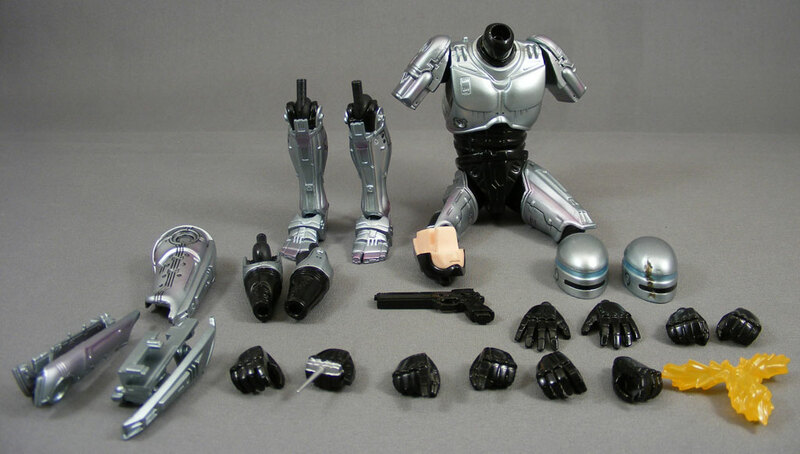 On a side note, why is the Kenner Robocop’s pelvis silver? You could say it was done to match his appearance on the Marvel cartoon, but why the heck did the cartoon do it? Did they think it just looked too much like a leotard and little boys would be turned off? Or maybe they felt it highlighted the crotch region too much and it would make little boys unnaturally curious about their adolescent equipment. Either seems plausible to me. 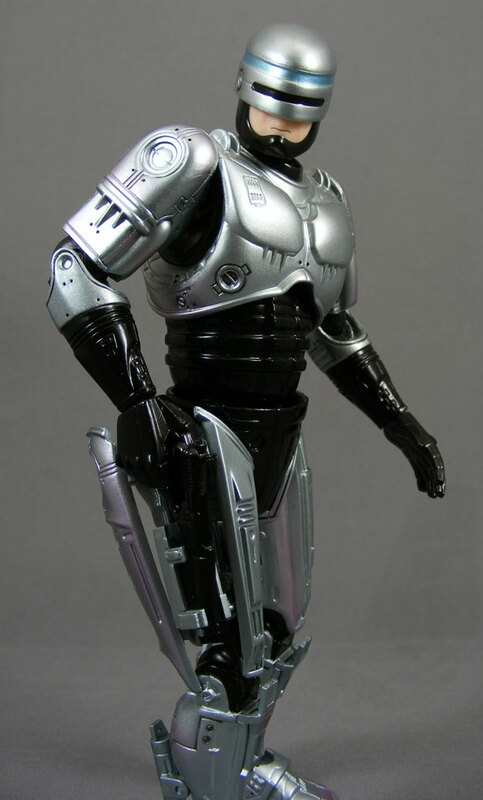 To make a long story short, yes, as a kid I painted my Kenner Robocop’s pelvis black to match the movie. I also gave him a blue sheen to match his look on Robocop 2. I did this with enamel paint, which left him feeling tacky to the end of his days. Back to the sculpt – the Figma figure won’t win this category. As with many Japanese figures, Officer Murphy has been anime-ized about 10%, resulting in a slimmed-down body and a face that’s nothing more than a simple black line, like the mouth of a South Park character. He’s also smaller and therefore some of the bits are simplified; for example, the “clamps” on the shoulders are just solid on the Figma figure, whereas they’re half-rings on the NECA and McFarlane versions. 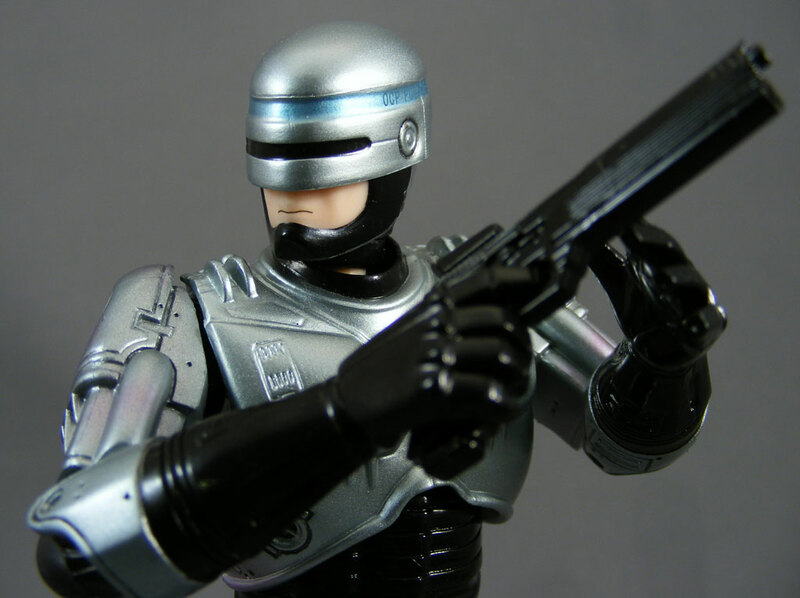 I’ve seen different reviewers have completely different assessments of the paint on Robocop figures. One reviewer will praise a figure for having a blue sheen while another will praise it for not having much of a blue sheen. For the record, I think there was a very slight blue sheen in the first film and a very strong blue sheen in the second. Of course, in theory all of these figures are based on the first film. 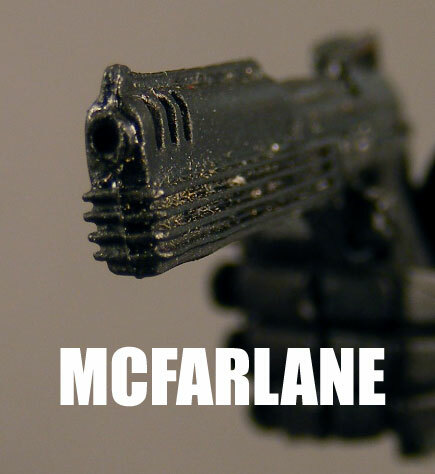 Which means McFarlane is, in theory, right out – it’s very blue. But wait! One thing McFarlane has going for it is that the paint job really brings out the details in the sculpt, thanks to some a decent wash. Compare him to the NECA version, where a lot of the details blend together among all the silver. The Figma figure also has a better wash than the NECA version. However, it has some oddities, such as the strong blue coloring around the “headband” and odd tones here and there, such as touches of purple on the toes. Actually, not quite enough. This is sort of a review of the Figma figure, so I should state what he’s got: a ball-jointed neck, ball-jointed shoulders with a very wide range of movement, hinged elbows, ball-jointed wrists, a ball-jointed upper torso, a ball-jointed lower torso, ball-jointed hips (again, with a far wider range of movement than either McFarlane or NECA), hinged knees, and hinged ankles with excellent side-to-side motion. 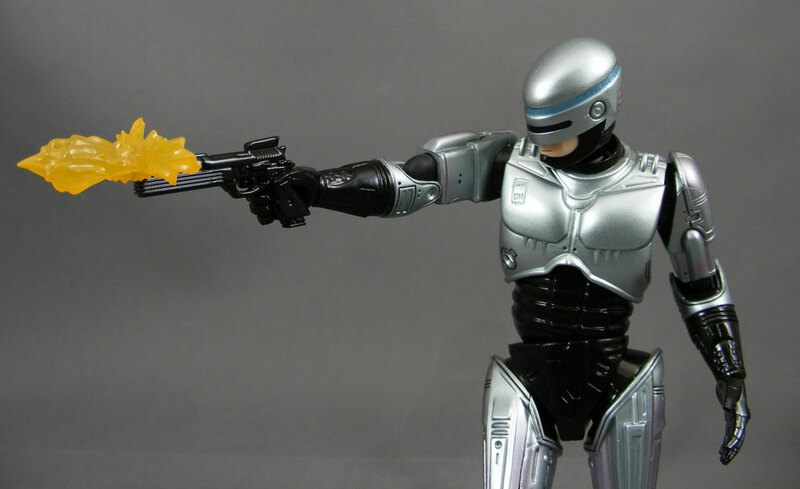 All Robocop figures have to come with his iconic gun (well, except for the Kenner version, much to the chagrin of 10-year-old Poe), and I’m not sure whether any of them have been quite right. Honestly they’ve always seemed a little too short and thin to me, but it’s possible that’s just the way it was in the movie. Let’s have a look, shall we? Here’s a side shot of the weapon from the movie. And here it is straight-on. And now, on to the toy guns. McFarlane’s gun is clearly too small compared to the size of the figure’s hand. The wide of the barrel seems about right, though. You can’t see it in the pic, but the edge of the clip is also sticking out from the bottom of the grip, which appears to be accurate to the film. 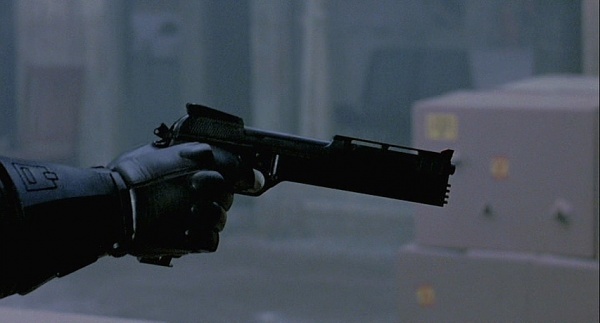 As a kid, I always thought of Robocop’s gun as a huge hand-cannon. Watching the film now I realize it wasn’t actually that big, but what I like about the Figma version is that while it’s not as accurate to the movie, it’s more accurate to how I think of the gun. That doesn’t mean it’s going to win the category, but it is something I personally like about the Figma version. Like the McFarlane version, the Figma version has a bit of clip sticking out from the bottom of the gun. So who wins? McFarlane’s is too small, but has good proportions and details and has the clip; NECA’s is the most accurate in size and details except it’s inexplicably missing the clip; and while I like the oversized Figma gun, it’s inaccurate to the film. I’m calling this one a draw. 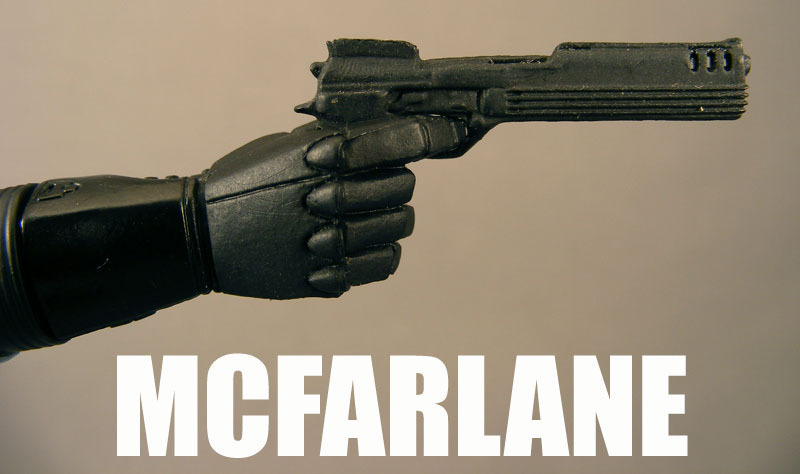 McFarlane’s version only came with the gun and a sculpted display base. The NECA version came with the gun and the alternate data spike hand. So, how about the Figma figure? We’ve got the gun, an alternate “battle damaged” helmet, ten separate hands including the spike hand, a muzzle flash, and alternate thigh parts to recreate the opening thigh. It’s worth noting that unlike NECA’s spring-out holster version, the inside of the Figma’s holster is actually sculpted to match the movie. Oh, and I almost forgot – he also comes with a stand that can plug into his back, to help with poses that might otherwise be difficult to balance. 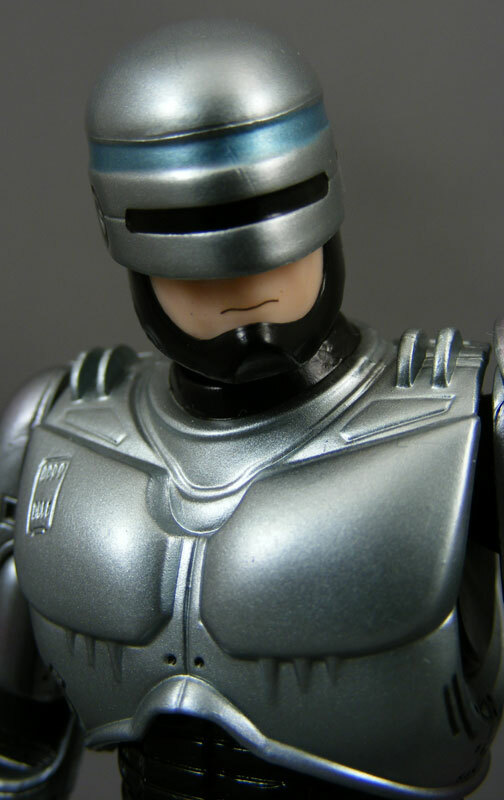 Speaking of quality control issues, another reason I returned my first [NECA] Robocop was because one of the little round clips on his shoulders was torn off in the package. Upon opening my replacement, I discovered the ankle piston on the right leg was simply missing. 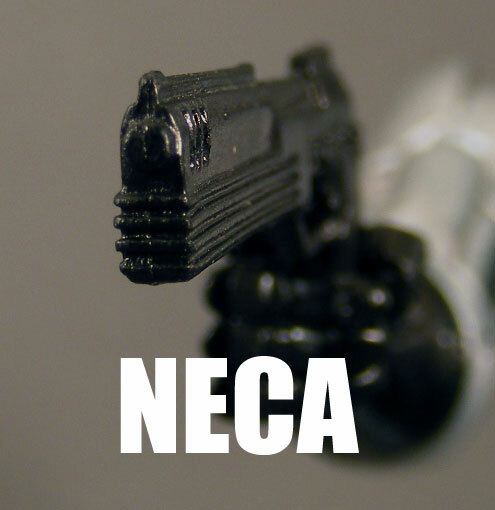 I’ve emailed NECA’s customer service to see if I can get a replacement–I’d be happy with just the part, since I could just glue it on. Of course, when you get all those accessories, you have to pay for them. When McFarlane’s figure came out in 2004, it retailed for somewhere around $12, as I recall, and included the base. NECA’s figure will run you between $18-$22 depending on where you get it. 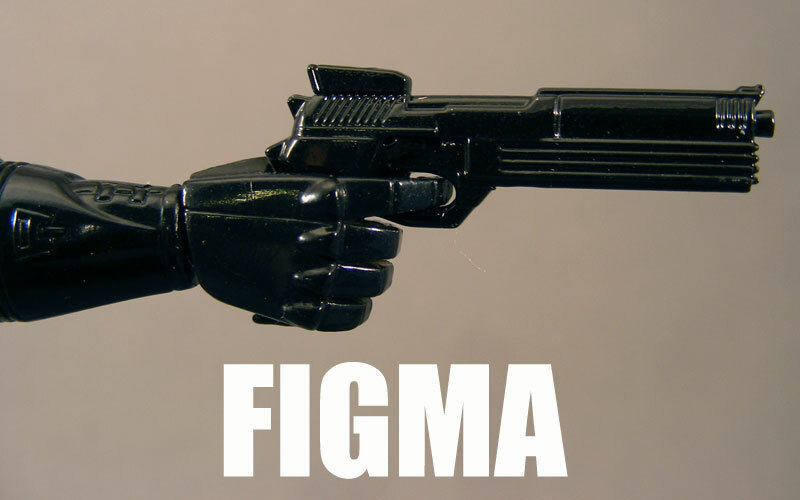 Figma’s version will cost you at least $40. 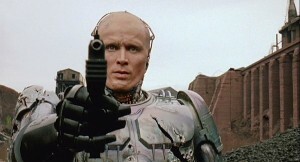 This one’s tough, because it depends on what you want from your Robocop figure. Do you want lots of articulation and accessories? Or just a really accurate sculpt, and decent articulation? Do you want a display base? And so we have a tie, with NECA and Figma each pulling three apiece (while McFarlane’s version sits in the corner, sobbing softly and thinking of how he’ll never know the touch of his wife again). Disappointing perhaps, but what I take away from it is that you should just get whichever one appeals to you the most. Prefer to have tons of accessories for posing options? Go Figma. Really love the idea of a spring-out holster? Go NECA. Want to pose him like the cover of the first issue of the Marvel comic, as I did? 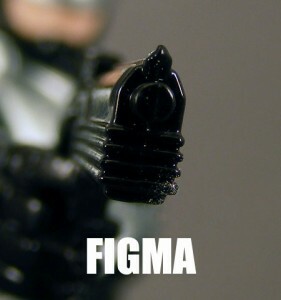 Go Figma. Cheap? Go NECA. The important thing is that whichever one you get, you go through one of my sponsors as a simple thank-you for this write-up. Or don’t. I don’t like being pushy. Note: This article was updated to add mention of the McFarlane figure’s display base. Very cool write up. 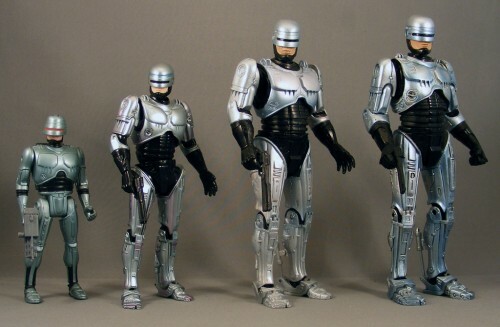 I only own the first NECA Robocop, but I've been wanting to pick up all of the variations. The Figma version is very cool, but one of the downsides of that figure for me is the scale. With my NECA (or even a McFarlane) Robocop, he can hang out besides many other 80s action icons such as any of the Terminator, Predator, Aliens, Rocky, or Rambo figures. While I love the Figma version, I imagine he'd pretty much be hanging out by himself. He's the kind of figure I'd love to display on my desk at work to fiddle with, but he'd have nowhere in my display room. BTW, Poe, have you played Farcry 3: Blood Dragon? 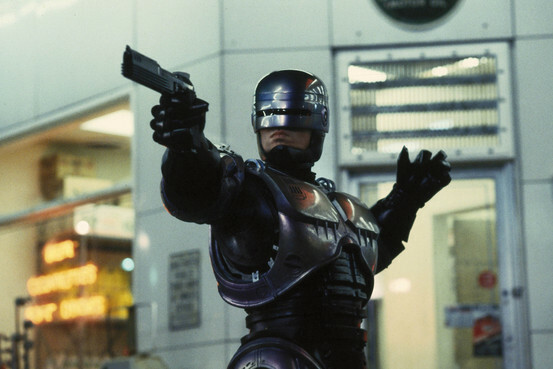 The main pistol is definitely Robocop's gun. Heck, the game even says it's named after a fallen Detroit Police officer and is called the AJM9. Figma's gotta be commended for the articulation and accessories they implemented. It doesn't seem to have a huge impact on the sculpt. I wouldn't mind if NECA updated theirs with a wider range of articulation. I find that both McFarlane and NECA's have very limited posing options. I could care less about Robocop these days, but I'd give aesthetics to the McFarlane figure and everything else to Figma. The McFarlane one also can with an intricate base. Overall, I think it looks the best based on sculpt and paint. 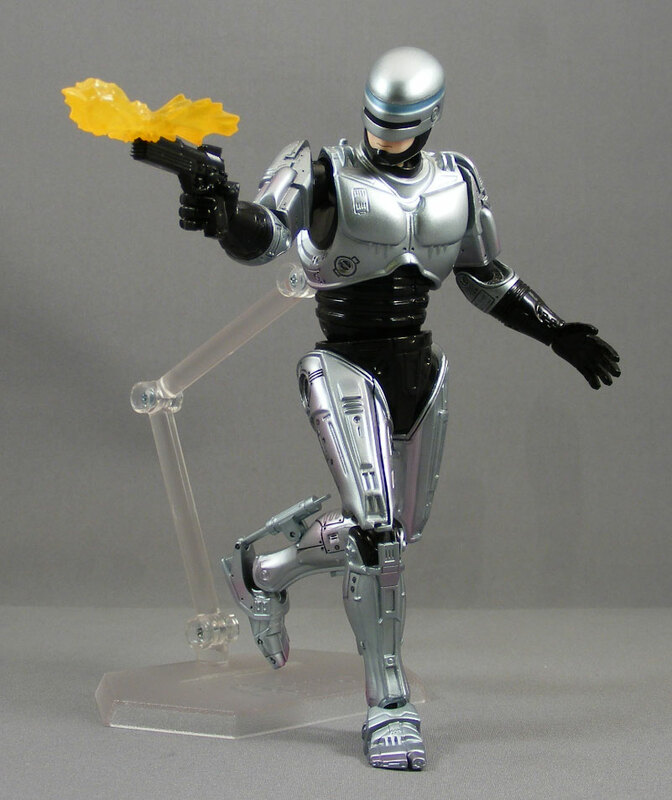 Robocop is another one of those figures where I don't get why people need him to be SOOOPER-POSEABLE, since he really never really strikes any dynamic poses. I forgot about the display base, but after revising it I don't think it really changes my assessment. It's a great accessory, but for me it doesn't beat everything that comes with the Figma version. 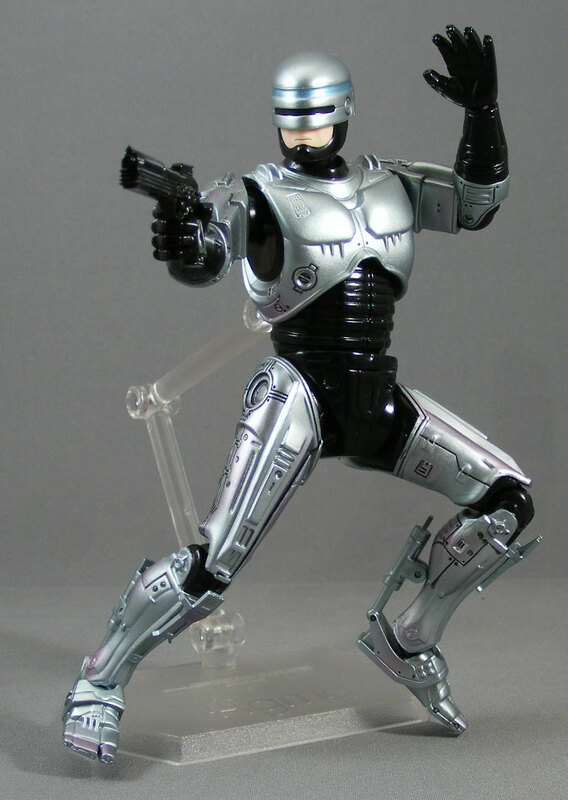 And as someone who enjoyed the more active Robocop of the Marvel comic and cartoons as a kid, I appreciate the greater range of the Figma articulation. I do not know what happened to my McFarlane Robocop, but I still have his display base, and it has shown up in more photos than I can count. see… i don't know man. the no-look over the opposing shoulder is really the only pose that the figma can take over the NECA that i feel like is character appropriate. 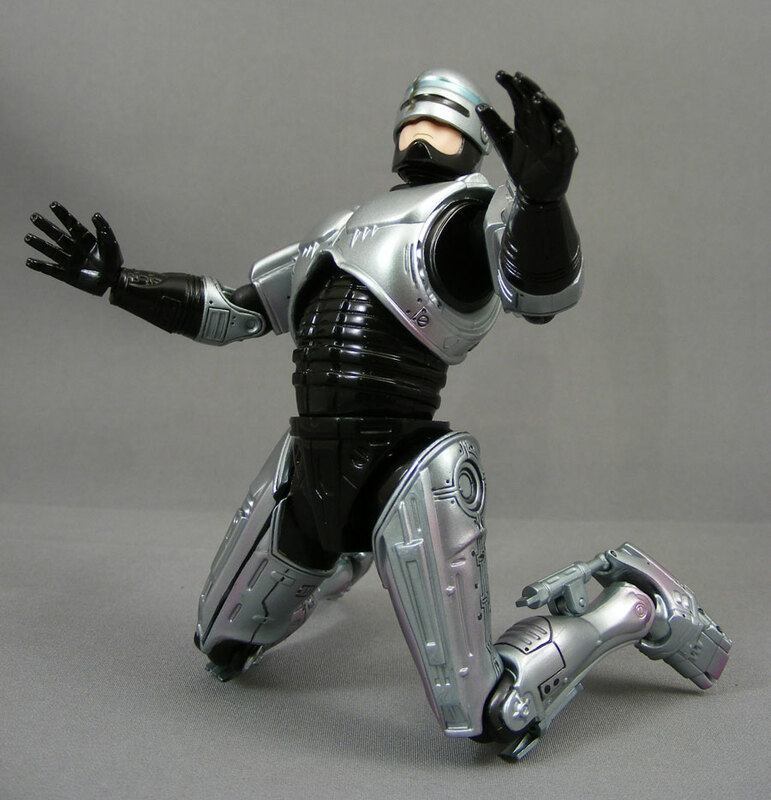 he shouldn't be able to do the hustle or take a three-point stance, that's not robocop! i'm not saying he should be movie-stiff, but certainly not much better than that. even in the comics, the guy was not exactly captain america. I find the NECA and McFarlane figures pretty stiff, stiffer than he was in the movie. In any event, I love articulation and therefore I like the Figma. 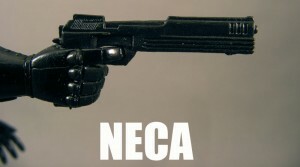 If people don't want the articulation, or don't want to spend the money, then by all means buy the NECA fig. Different strokes and all that. Fair point, dayraven, but a company could produce an action figure of a statue and I'd be thrilled if it had great articulation. indeed, and for the record, it's not like i hate articulation, i do own a super-articulated gothmog, and somehow still can't wrap my head around how that works… but gothie isn't articulated in that key character trait, his left elbow… so he has the trait that most visually defined him. same w/ murph, i'm cool if he's stiff, cuz the guy was stiff. i get plenty of posability of murph, on both his feet, from my NECA one, i feel like that's all i need, personally (if i need any "murphy on ice" poses, i'll call figma.) again, i agree w/ poe, you buy the one you want. cuz there's one for every taste… just saying that i wouldn't consider the NECA one under-articulated, i'd consider him par, then the figma significantly super par, and the mcf sub par… and kenner bringing up the rear. i agree with the above who said neca should improve the articulation of the sculpt they already have. that would be killer! Again, it's all about what you want. I was annoyed by the blue on the head, but I wanted the articulation and accessories more. When it comes to Robocop, I already had to get used to a really inaccurate version with the Kenner one I had as a kid. Just getting the black lower torso on the Figma figure is enough to make me happy. I don't want to sound like I don't like the NECA version – I do! If you want something to stand alongside your Movie Maniacs and your other NECA figures, it's the one to go with. I just prefer the Figma because of the articulation/accessories/etc. The NECA and the Figma can get their right arms out the farthest (Figma a bit farther), but neither of them can get the arm quite as parallel to the chest as the pic. And while neither can get the left arm in that position (it would require double joints at the elbows), the Figma comes much closer than the NECA one. lol, sweet, thank you for the further info! is there something wrong w/ you guys' figs? mine isn't spot on in that position, but it's close enough for government work… that's the pose i leave him in when he's on display. hey poe, do you plan to get that hot toys 300$ robocop? that thing looks insane! It looks totally awesome (ED-209 too), but I can't afford it. Also, I don't really collect the 12" scale. I am! Both! The reason I held off on the NECA Robo was to pinch every single penny possible to buy the HT one. And Poe nailed it with sideshow freaks: holy crap can they nitpick. Murphy's face on the Figma version is just atrocious. 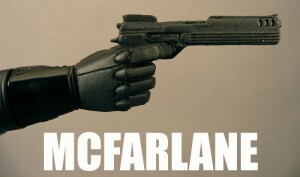 Personally I prefer Mcfarlane´s Robocop!